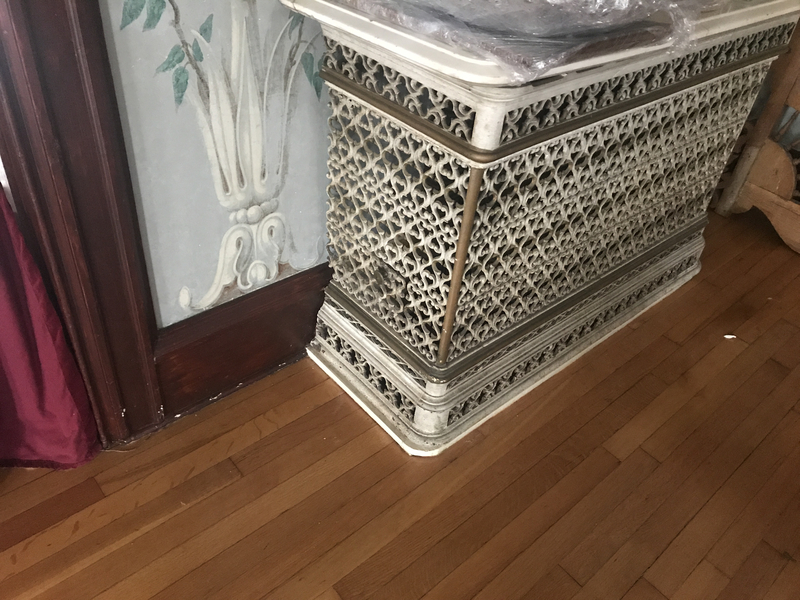 I recently became a steward of a grand 1874 house. And of course the first step is bringing the steam system up to my standards. It actually works reasonably well - no hammer and most radiators heat up pretty quickly from half-million BTU WM 78. But also set at 10psi and I'm sure is using way more oil than necessary. But my first step is figuring out the radiation. 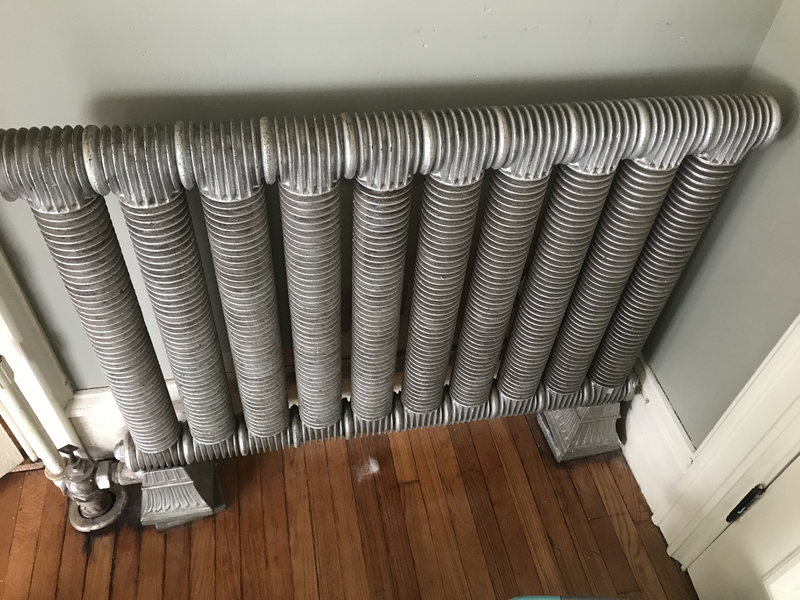 There's a number of more common column and slenderized rads, but there's also quite a few of what I presume to be the original radiators from when the house was built. I have never seen anything like that(and couldn't find them in Dan's book) Very interesting design and the only thing I could make out on them is the patent date of 1864. Here is one, I hope someone can help me at least ballpark their EDR rating. It will take some measuring and some math -- but keep in mind that one can come up with a pretty good approximation of EDR by regarding it as the same as the actual surface area. So... for the pipes -- vertical tubes and headers -- just figure the surface area normally (circumference of the tube times length -- converted to square feet, of course). Then the little fin like things are added on: figure the area of each fin (outside diameter squared times .785 - inside diameter -- the diameter of the tube -- squared times .785. Double that and you have the area of a fin. count the fins (easiest to count the fins per inch and multiply by length) (again, covert to square feet) and add it to the tubes. Will it be exact? No. Will it be close enough? Sure will. Wow!! I will bet those heat like a SOAB. I agree with @Jamie Hall method. There is another way but it's not practical. Disconnect it and drop it into a tank of water. Measure the water volume before and after dropping it in. Plug the connections so no water can get inside. I can even go with the paint method, but I'll stick with the math That was my backup plan anyways, but figured it wouldn't hurt to try the easy way out. I don't think that would be accurate. A smaller radiator with a lot of surface area (like the ridges on this one, or one with more columns for example) might have more EDR than a larger volume radiator with smooth surfaces, no? I've seen those before but can't remember what they're called. Is there anything on the end caps at the top? I've seen them before too. I recall a thread on here two, maybe three years ago with some pictures of them. Might be worth a search. I just don't know what key word to narrow down the number of hits. It is, about to order the vaporstat and main vents. But while I wait, I like to have some data to look at it. I could only make out few letters and the patent year under the layers of paint. 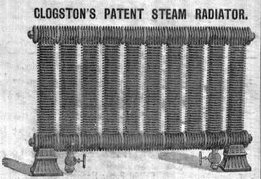 Should be able to search the Patent Office's site using the year and the word "radiator". 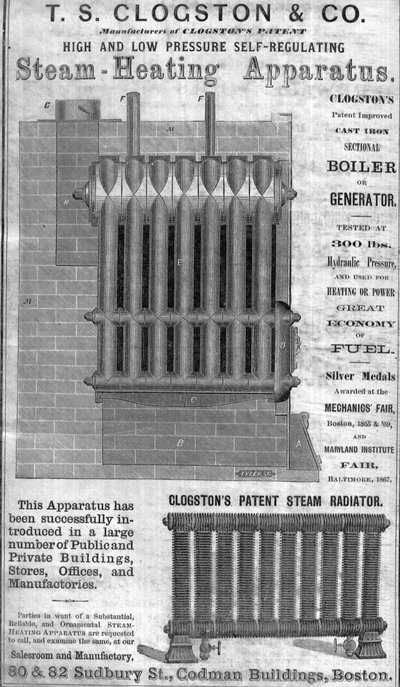 It's a Clogston radiator. We have one on display at The General Society of Mechanics and Tradesmen. If you're going to Wetstock you'll see it then. Here's what our archivist, Angelo Vigirito, found on it in his research. Sadly, no ratings. Thank you ver much Dan! You're welcome, @vvzz2 . I wish I had a rating for you. Where they once made them is now a parking garage for Boston Public Market. Actually, that's Rolla Carpenter's "Heating & Ventilating Buildings" and he cited John Mills as his source for the table. The book is in the public domain so you can download and save the PDF file. I pulled the table out of the main file and have attached it here. It contains not only the Clogston but several others using what amounted to ribbed or ringed pipe. @Erin Holohan Haskell , would you agree this should be filed under "Radiators" in the Museum section? Good catch, Steamhead. I was typing too fast and thinking too slow. Thanks! You got it! Thanks, @Steamhead. My hats off to Dan and Steamhead! Amazing bit of research, all done in the course of a few hours! 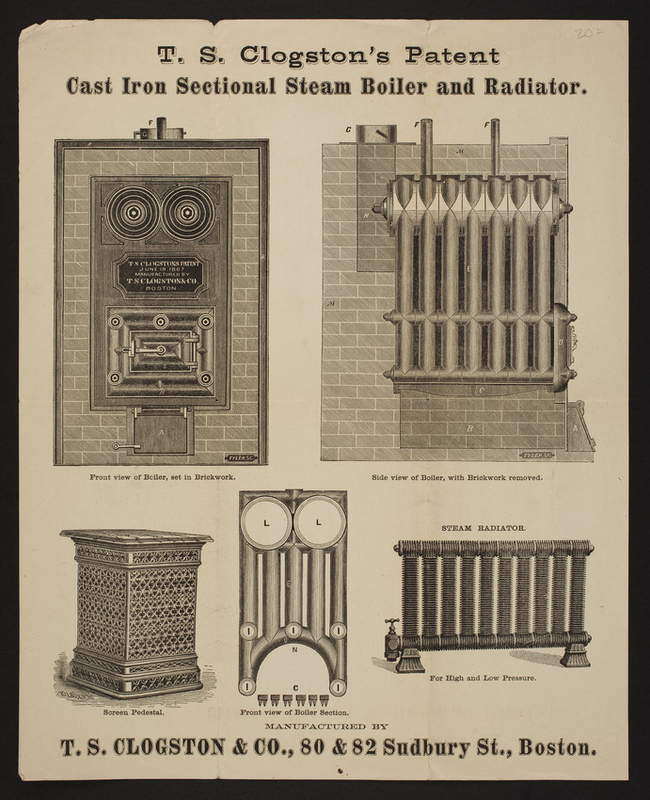 Good concrete information for a very unusual and obscure piece of steam heat history. WOW! Thanks, Dave. That's what this place is all about. 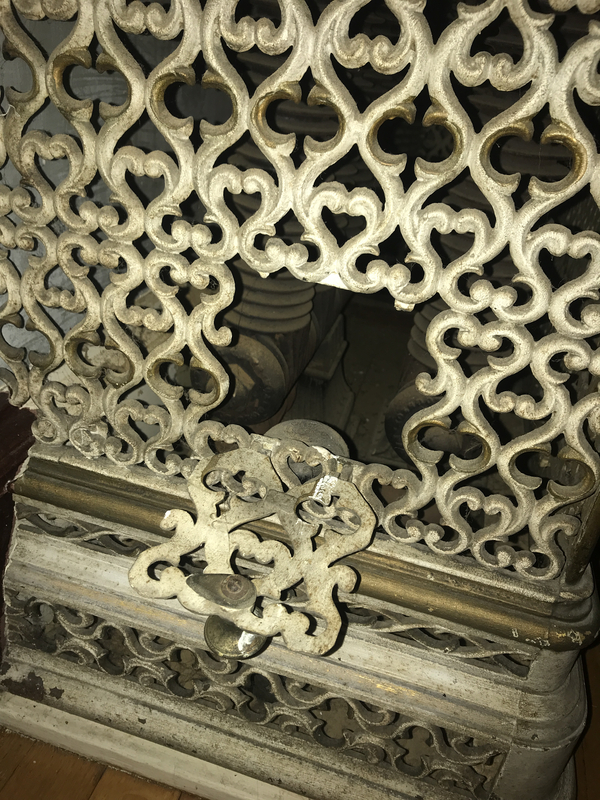 Looks like the radiator covers(screen pedestal) are made by Clogson as well. 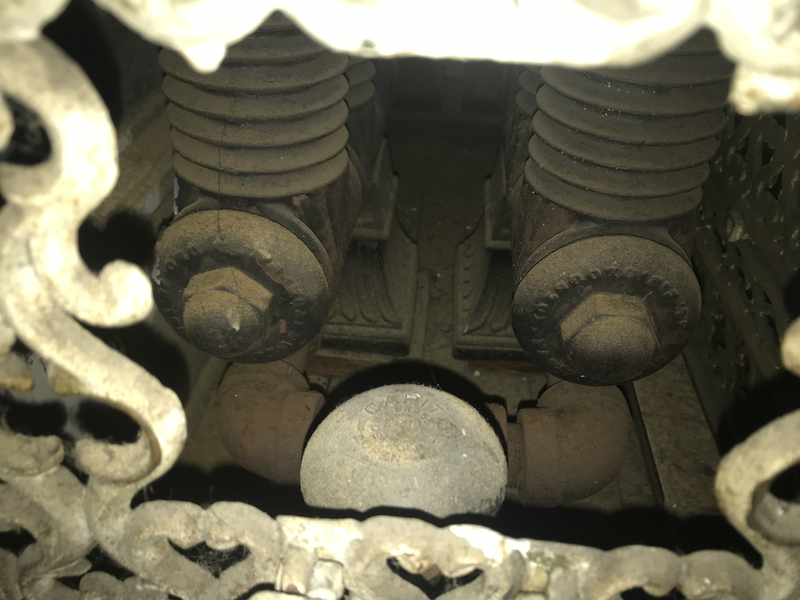 Also of interest is that there are two Clogson radiators side by side in there, but off of one valve. Beautiful. Where is this house? Lowell Mass. The marble tops of those radiator covers are even coordinated with the fireplaces in the room. There they are. Mr Clogston even thought of a little door in the cover to access the valve! How an earth would these beauties be painted back in them days! And I do admire the openness, questions and wisdom on this site. Have been following it for a number of years now and always find really interesting snippets of info. I believe they would immerse them in paint. Thanks.